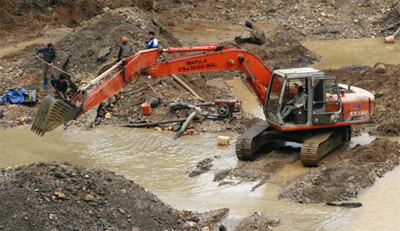 The Government has issued a Decree on environmental protection fees for mining businesses. According to the decree, metal exploitation will be charged from between 10,000 VND and 270,000 VND (0.45 - 12.15 USD) per tonne, while the figures for non-metal mining will be between 1,000 and 90,000 (0.045 – 4.05 USD) per cubic metre or tonne. Crude oil is subject to a protection cost of 100,000 VND (4.5 USD) per tonne. The extraction of natural and coal gases will cost 50 VND per cubic metre, while natural gases collected through crude oil exploitation will be charged at 35 VND per cubic metre. Payments for the exploitation of crude oil, natural and coal gases will be channelled into the Government budget, while others will be added to local budgets. No environmental protection fees will be issued on dirt and rock from coal mining until the end of 2017./.